Chocolate lovers, unite! At Ghirardelli Square, you can take a whiff of rich, world-class chocolate while enjoying the perfectly salty breeze of the San Francisco Bay. Peruse the old factory and its surrounding shops, and get classy with a wine tasting at Wattle Creek Winery. With seven-day citywide transportation included in your San Francisco CityPASS and a trolley stop conveniently located right in front of Ghirardelli Square, there is no reason to pass up this sweet slice of history. Ghirardelli Square isn't just a place to eat some delicious, high-quality chocolate; it's a place to explore American history—the chocolate way. Established in 1852, chocolatier Domingo Ghirardelli moved his company to four different locations before settling on North Point Street, or what is now known as Ghirardelli Square. Although the original factory was sold and transferred elsewhere in the 1960s, a group of San Franciscans who were eager to preserve the historic factory purchased the property and made the square what it is today—a fabulous hodgepodge of great restaurants, one-of-a-kind shops, and mouth-watering chocolate. The Ghirardelli Ice Cream and Chocolate Shop in the Clock Tower building pays homage to the original factory by giving visitors like you a first-hand view of chocolate manufacturing equipment. After you enjoy creamy, San Francisco-themed sundaes such as "The Ocean Beach Sea Salt Caramel Sundae" or "The Golden Gate Banana Split", don't forget to read the placards around the square—they tell the story of the factory, how it came to be, and its importance in San Francisco history. It's not everyday you have an excuse to eat chocolate at 9am, but when you're in Ghirardelli Square, the enticing smells and rich history are reason enough to satisfy your sweet tooth all day long. Even if you're not much of a chocolate lover, there are plenty of wonderful restaurants in the square that can sate any appetite. Step back in time at Lori's Diner—a '50s themed restaurant where you can get a classic Coca-Cola and an all-American burger and jam out to some good ol' rock & 'n' roll. Savor the taste of seasonal seafood or a 13 oz. Ribeye Steak at McCormick & Kuleto's Seafood and Steaks. After you've filled up, you can work off your meal by exploring the unique boutiques that make Ghirardelli Square a wonderful place to shop. San Francisco's Muni system is as diverse as the city itself. With 800 buses, 200 streetcars, and 40 cable cars running through the veins of San Francisco, there is simply no place you can't get to. On a Muni bus, you can hop off at a stop right on North Point and head right in, or you can take the Powell-Mason cable car line and walk about a block from the Beach and Hyde cable car stop to make your way to the entrance. It's worthwhile to take advantage of the seven-day muni pass with a CityPASS booklet—taxi expenses add up rather quickly. Not only is Ghirardelli Square a treat on its own, it's also close to some of San Francisco's other must-see attractions. Fisherman's Wharf is a crazy-popular tourist attraction and rightfully so. From Ghirardelli Square, take a short walk to Fisherman's Wharf and the famous Pier 39, where you can learn about the ins and outs of the fishing industry and enjoy some fresh steamed crab from one of the many historic seafood stands. Don't miss a trip out onto San Francisco Bay with Blue and Gold Fleet Bay Cruise, included in your CityPASS booklet. You'll sail past the famous Pier 39 sea lions and catch great views of Alcatraz Island, the Golden Gate Bridge, and the San Francisco Skyline. 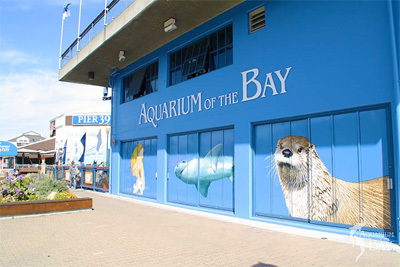 From there, see the beauty of the Bay up close and personal at the San Francisco Aquarium of the Bay. Over 20,000 local sea creatures—from sharks to jellies—will give you an oceanic experience unique to San Francisco. After you've had a long day sampling chocolate squares, touching sea stars, and eating delicious San Francisco dishes, you might want to settle in for the night at a nice hotel. For a sea-themed siesta, The Argonaut Hotel of Fisherman's Wharf is your comfy waterfront stop. Or, if you want to rise and shine and get straight to the chocolate, you might want to book a stay at the Fairmont Heritage Place located right in the heart of Ghirardelli Square. A luxury experience that is just as warming and delicious as the famous Ghirardelli chocolate, Fairmont Heritage Place truly meets the mark of world-class service. There are plenty of nearby hotels to suit your needs and budget. From the Hyatt and Argonaut to the Holiday Inn, you can customize your Ghirardelli visit however you see fit. Before you plan your trip to San Francisco, take a good look at weather forecasts. Although San Francisco does have its sunny summer days, there are bouts of fog and cold that could really put a damper on the outdoor Ghirardelli Square experience and muddy the beautiful Bay view. But even on a rainy day, you can still enjoy a delicious hot chocolate from the Ghirardelli Ice Cream & Chocolate Shop. The spill over from Fisherman's Wharf means a lot of tourists will be making their way to Ghirardelli Square along with you, but the weekends are by the far the busiest. Avoid the thick crowds by visiting Ghirardelli Square during the weekdays; the earlier in the day, the better. Also, if you're eager for a world famous Ghirardelli sundae but don't have the patience to wait in a line, there is a hidden treasure on the 2nd floor—a practically line-less ice cream shop. It's the same delicious, sweet goodness without the wait. Aside from great food, Ghirardelli Square is home to a handful of interesting boutiques worth visiting for gifts for yourself or loved ones back home. At ElizabethW, you can find luxury bath & body products, soy candles, and even handcrafted linen drawer liners. Shop the Helpers Bazaar, a charity-driven boutique, and find a unique vintage gift or piece of jewelry to admire. If you're looking for a healthy pick-me-up, the recently opened Juice Shop is the hip new place to get a tasty drink. With 12 juices and four elixirs, you can enjoy a fruity smoothie, a seasonal drink, or a blend of nutrient-rich ingredients for a natural source of energy. Under new ownership, Ghirardelli Square will be revealing some new, delicious restaurants in the near future that will be well worth your appetite. An Italian-influenced restaurant "Brezza Emporio and Pizzeria" will cater to locals and tourists alike. The menu will offer fresh pasta, pizza, and grilled meats. 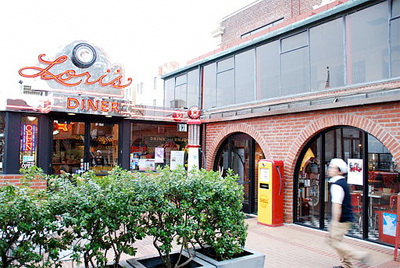 Local favorite Le Marais will be making its way into the Ghirardelli Square for a Marina bakery that will open up in May. The new owners plan to focus on food that is local—so you can get a taste of what it's like to be a San Francisco native. Ghirardelli Square takes part in many wonderful events throughout the year. In May, enjoy great wine, local food, and live music as festivities liven the entire Square and Beach Street. On Independence Day, Ghirardelli Square offers the perfect view of the fireworks as they light up the Bay. Perhaps the most popular Ghirardelli event is the annual Chocolate Festival held every September 10-11. Sample the finest desserts from local companies and get your fill of the always-delicious Ghirardelli chocolate. Live music, ice cream eating contests, and entertainment for adults and kids make this festival an experience worth waiting for. Whether you've been to San Francisco many times before or have yet to see the Golden Gate Bridge in person, Ghirardelli Square is definitely worth visiting. With a CityPASS booklet, you can see any of the included attractions at your own pace and at a great savings in any order you'd like, so you can check out San Francisco's other awesome attractions (like Ghirardelli Square) in between. 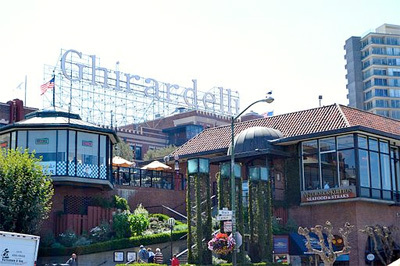 Ghirardelli Square is a chocolate wonderland you can't miss.